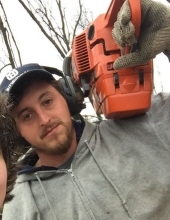 Mason Andrew Stickley, a devoted father and husband, 30, of Grottoes, passed away Wednesday, October 31, 2018, due to a work related accident. Mason was born in Harrisonburg on August 7, 1988, a son of David Stickley of Grottoes, and Lillian Rachel (Mace) Baber and husband, Shannon, of Grottoes. He owned and operated Stickley Firewood and Landscaping and was a graduate of Spotswood High School, class of 2007. On May 9, 2015, he was united in marriage to Leslie (May) Stickley, who survives. Mason is also survived by children, Carter and Hayvin Stickley, and Shayan Stickley; sister, Makayla Stickley of Grottoes; stepbrother, Jacob Baber of Amherst; paternal grandmother, Betty (Bert) Stickley of Grottoes; numerous aunts, uncles and cousins. He is preceded in death by maternal grandparents, Herman "Hook" and Lillian Mace; paternal grandfather, Stanley Thomas Stickley. The family will receive friends from 6 until 8 PM Monday, Nov. 5, 2018, at Johnson Funeral Service in Grottoes. A funeral service will be conducted 1 PM Tuesday, Nov. 6th, at Mt. Vernon Mennonite Church in Port Republic, with Pastor Mark Wingfield officiating. Burial will be private. Memorial contributions may be made to the family to aid in unexpected funeral expenses. To send flowers or a remembrance gift to the family of Mason Andrew Stickley, please visit our Tribute Store. Pastor Mark Wingfield officiating. Burial will be private. "Email Address" would like to share the life celebration of Mason Andrew Stickley. Click on the "link" to go to share a favorite memory or leave a condolence message for the family.